This is Doosan Infracore’s first integrated report, which includes company’s financial and non-financial achievements in a balanced way faithfully. ①The cover and spine express the company’s competitiveness, strategy, performance and notion of new value, “building”, by utilizing CI motif- square- under company’s slogan ‘Building your tomorrow today’. 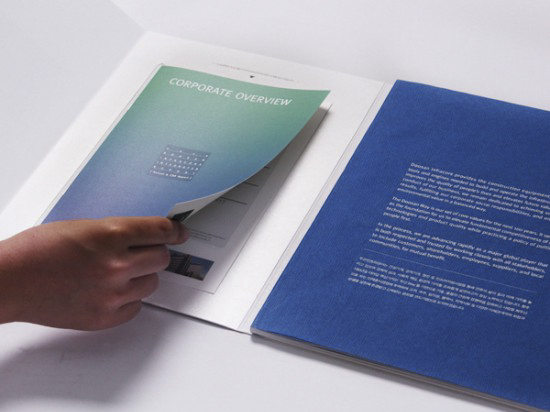 ②The blue-colored paper(CI color) on page 1 symbolizes the Doosan spirit. ③The different readers’ needs are reflected in two types of design—a magazine and an academic paper—within one report. ④There is a separate booklet with the company’s basic information.